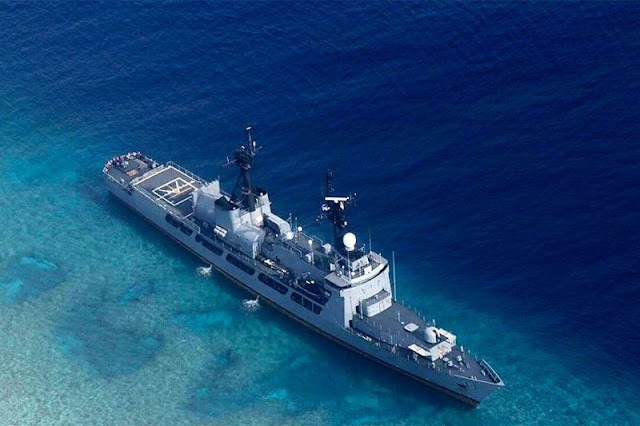 MANILA --- Philippine Navy (PN) flagship BRP Gregorio Del Pilar (FF-15) is expected to be in Subic Bay, Zambales to repair damages caused by her Aug. 29 grounding in Hasa-Hasa (international Half-Moon) Shoal, Palawan within two to three days. Steaming time for Subic Bay is estimated to be "two days and 15 hours," he added. The ship is now being towed to Subic by the tugboats earlier dispatched to the scene. Initial damage assessment indicated that the BRP Gregorio Del Pilar is limited to the ship's starboard (right) propeller which was earlier reported detached due to the grounding but repairable. Meanwhile, PN flag-officer-in-command Vice Admiral Robert Empedrad lauded the officers and crew of the BRP Gregorio Del Pilar for "their for their composure in ensuring that no further damage was incurred while the ship was aground and while being retrieved." "The estimated dockyard time will still have to be determined as soon as BRP Gregorio Del Pilar reaches the repair facility in Subic. Although, both of its propellers were damaged no punctures or holes were noted throughout its underwater hull and freeboard," Navy spokesperson Commodore Jonathan Zata said.